to be honest dickster, unless you're having issues with the default open source driver i never bother installing amd's own drivers any more, i do install nvidia's own drivers though. good idea dickster sorry i was of no help. try this on first boot when it gets to black screen with cursor, press WIN+P keys, tap down arrow key once then tap enter. with luck you will now see the desktop as normal. i think the issue may have something to do with windows thinking you have more than 1 monitor connected and is displaying on the wrong one, doing the above will tell windows to display on both screens in duplicate mode. you may have to try tapping down arrow key twice for extended desktop if once didn't work. when you can see the desktop i'd download and run intels update software and then i'd update the graphics drivers with luck that will stop the issue. Any of you SUSE users seen this?? air pollution looks fine to me with everything in green for liverpool. must admit i don't remember ever seeing such air pollution, as shown in tomks pics, anywhere in the uk. wow, those fires must be huge. those pics remind me of those cities in china with huge air pollution problems because of traffic. and can post just no smilies or advanced options, so the 2 must be linked somehow. seem to remember i had this problem last time changes were made and needed to allow googleapis or something like that then too before everything worked. "and from what I'm seeing so far, the software is more responsive. " can't say the same from my end. just sorry we couldn't get to 100% of the files being seen in windows, even though they are still on the drive somewhere. i'm using firefox on linux with adblock, noscript and user-agent switcher add ons. user agent is set to show me using firefox on osx. i'll log out and see is disabling agent switcher makes a difference. made no difference so until i allow the script i can't post anything. not really but you never know. and that we've exhausted any hope of recovering the 0 kb files - short of me sifting through the files saved by Disk Digger, figuring out which ones are the ones that are showing as 0 kb on the old drive, and renaming those. yes afraid so, you'll have to find them on the backup drive and copy them to this drive. 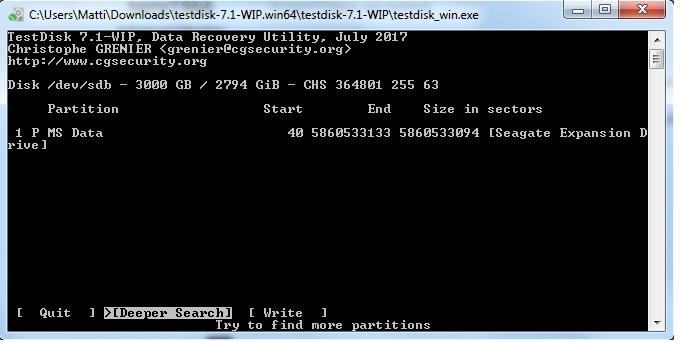 But TestDisk identified the drive as Intel (I distinctly remember that part), so I'm not sure how you would have known to rebuild the mbr with efi gpt? i should have noticed the size of drive and because it was over 2tb should have at least checked things with efi gpt first before suggesting you go ahead and rebuild the mbr. i think things could have still been salvageable even then, but after chkdsk ran and made changes to the mft/files it was then i think things got to a point where we were never going to be able to get everything 100% back to how things were., but we tried anyway. as a last resort run chkdsk on it now and see if it does anything. to be honest don't know why running windows or linux should make a difference. i doubt most people would notice because they'd have to be running noscript in the first place. until today nothing to do with invision was displayed. i'm curious exactly what is this invision supposed to do to increase security anyway? is there a site link i can visit to find out more about it? no i don't think you did anything wrong, i just decided to not try that route and thought the best you're going to get is what you have now with a single 3tb partition and what files you have on it now. if we made a mistake, it was way back at the beginning when we rebuilt the mbr after analysing the drive with intel instead of efi gpt and then ran chkdsk and it made changes to the files/mft. so to sum up i think what you have now is the best you are going to get. because of the partition starting at 40 you might want to use some software to make sure the drive is aligned but apart from that i don't think there is anything else to do. if you want to see if we can get all your files back, then in last screenshot choose repair mft and see what it shows, post screenshot. why do i now need to enable invisioncic.com before i can reply to any topics? yesterday i didn't need it, in fact yesterday it wasn't even a javascrypt listed and running on the forum. i'd like to know why it is needed, and what if anything of mine it's collecting? don't know why but this is really ping me off for some reason. no you shouldn't need to do anything else. the drive should show in windows and be useable with all/most of your data on it just like when it was in the old enclosure. what it shows as raw again in windows? it should have been showing as a 3Tb(about 2.7TB) drive with an empty single partition on it after you did the quick format. ok, i don't understand why it's showing as raw still but never mind. lets bite the bullet and write the partition and files testdisk found to the drive. now when you look at the drive in windows it should show 1 partition with your data on it. what do you see if you hit type? at the moment i'm not sure if it's best to just write the files it found and listed to the drive or try and see if it can find the original mft and repair that. i'd be a lot happier just writing the files it found if the partition started at 2048 instead of 40, does it look like all your files are there? if so then this might be best option and just write that partition table and filesystem to the drive. you might have some work still to do like search your backup files for the data that's 0kb in size and copy it back to the drive but it should now show in windows as a 3TB drive with most of your data there and useable. type p to see if it lists your files, post screenshot, then go back and hit continue, post screenshot. start testdisk again and this time instead of analysing the drive click on the advanced option and post screenshot, choose boot and post screenshot, choose repair mft and post screenshot. if i remember correctly in disk management you just right click on the partitions you want to change (same way you resized the 2TB) then click on delete until all the drive shows as free space. then right click on it and click new partition then follow instructions to create 1 new partition using all the space. once that's done and it shows up as a single 3tb drive in windows use testdisk to analyse the drive (efi gpt) and post a screenshot of what it shows. then do a quick search and post a screenshot of that too, then we'll see where we go from there. doesn't really make a lot of difference between /r and /f, only real difference is r will check for bad sectors where f won't, so r can take hrs where f doesn't take that long. as long as H is the correct drive then yes chkdsk /r H: or chkdsk /f H: will do. at this point, i'd just go into windows disk management delete all the partitions on the drive and create 1x3tb ntfs partition with quick format, then i'd see if testdisk could rebuild the file system on that partition so all your data showed up, if that fails then i'd simply bite the bullet and copy the backup files across even though it means a lot of work sifting through them. if you're not worried about the small 8mb partition on the front of the drive , then i'd simply use windows disk management to expand the 2tb partition to use all the empty space on end of drive (maybe try deleting the 8mb partition and seeing if you can expand the new larger partition into it too)then run chkdsk to see if it fixes the 0kb files that are there at the moment. and that i'm afraid are only options i can think of. on the one that's highlighted in last screenshot click p to list the files and then if they look ok make it primary and write it to drive. see how things look then, maybe run chkdsk too. if it won't let you list the files then to be honest i'd call it a day and delete all partitions, create 1 new one and copy your backup files across. that's funny, for me it appears right next to that network symbol to share post. try a different browser and see what results you get. i'm on linux of course and using firefox browser. i'm also using noscrypt, adblockplus and an agent switcher set to firefox on os x.
yes you can install programs anywhere. slow as anything for me, dislike nearly everything about new software. never mind will get used to it. eg. took nearly 20 seconds before this post was shown as posted. i think if you mouse over the post you want to report, then in top right of that post you'll see a report post link that doesn't show up unless the mouse is in the post.